"I believe he's not guilty." "No, but I have a reasonable doubt." This is a work of fiction. It's not "based on a true story." ... 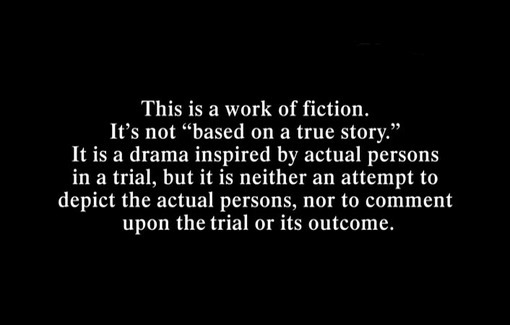 It is a drama inspired by actual persons on a trial, but it is neither an attempt to depict the actual persons, nor to comment upon the trial or its outcome. On the other hand, maybe Mamet was trying to avoid the trap the makers of "Zero Dark Thirty" set for themselves when, in interviews and pre-release publicity, they positioned it as the "inside story" of the bin Laden manhunt and began the film with: "This is based upon first-hand accounts of real events." That may be strictly true, but what does it actually signify -- especially when we know that "first-hand" eyewitness accounts are about as factually reliable as dreams? 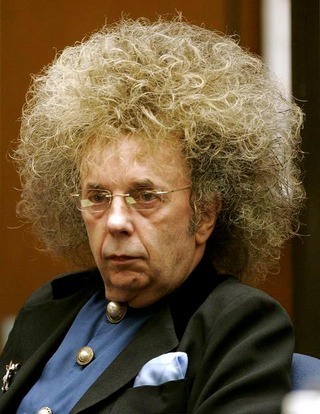 "Phil Spector," though, isn't about facts; it's about doubts. It's a tabloid morality play with a trashy sensibility and a first-class pedigree: not just Mamet but Al Pacino, Helen Mirren and Jeffrey Tambor. But it feels personal, too. I get the impression Mamet rather identifies with Spector, a short man and famously eccentric artist with a massive ego who is persecuted (and, in Spector's case, prosecuted) simply for being who he is. Or, at least, that seems to be the way Mamet perceives it. "Phil Spector" can be seen as a companion to Mamet's 1992 play "Oleanna" (incendiary stage piece; tepid film), itself inspired by the Clarence Thomas-Anita Hill hearings. So, did he or didn't he? Whom do you believe? And why? Only Phil Spector knows (or, at one time, knew) what really happened, since Lana Clarkson was the only other person in the room at the time of her death from a gunshot wound caused by a snub-nosed .38 Special revolver going off in her mouth. The movie essentially takes the form of a trial -- not just in the courtroom, but as a case argued by the defendant himself before his own lawyer, Linda Kenney Baden (Helen Mirren). The jury is You, The Viewer, and everyone watching the fictionalized Phil Spector and the fictionalized "Phil Spector." Baden (who was a consultant on the movie) is introduced as someone who's initually sure Spector is guilty, but after meeting him and taking another look at the evidence, she changes her mind. He may be crazy, volatile and even violent (he has also a "gun nut"), but, even taken all together, those things don't add up to a case for murder. The case against Spector (as presented in the movie, anyway) comes down to this: The famous, freakish, reclusive Wall of Sound record producer had a history of erratic, violent and threatening behavior (particularly with women) and liked guns more than dames. Very early on the morning of February 3, 2003, a struggling 40-year-old actress named Lana Clarkson ("Deathstalker," "Barbarian Queen," "Amazon Women on the Moon"), who was working as a hostess at the House of Blues on Sunset Blvd., met Spector and accompanied him back to his Alhambra home, the 33-room, 1926 castle formerly known as Dupuy's Pyrenees Castle, which Spector bought and renamed for himself in 1998. While Spector's Brazilian chauffeur, Adriano DeSouza, waited, Clarkson went in with Spector. About an hour later, DeSouza heard a gunshot and said his employer emerged moments later holding a pistol and told him "I think I killed somebody." It's not true that a prosecutor must prove "means, motive and opportunity," or that they are sufficient to convict someone of a crime. What's needed is evidence to establish guilt beyond a reasonable doubt. Spector's first trial ended with a hung jury, 10-2 for conviction; in his retrial he was found guilty of second-degree murder. "Phil Spector" is about the first trial but -- being a "work of fiction," remember -- it may also include some details from the second. In emails and other "diary-like writings," Clarkson reportedly wrote of being in dire financial straits, discouraged, depressed and even suicidal. The defense also speculated that Clarkson, if she'd been playing around with the gun and had put it in her mouth, could have been startled when Spector re-entered the room, saw her, and shouted, "No!" In Mamet's movie, the prosecution speculates, based on Spector's past loony behavior, that Clarkson may have wanted to leave and Spector was trying to force her to stay at gunpoint. Again: What if he did? That could be attempted kidnapping or maybe unlawful restraint and/or assault with a deadly weapon. But where's the evidence that he put the gun in her mouth and pulled the trigger? I don't want to make this appear to be a review of the HBO movie, because it's not. I will say a couple things, though, about the writing, the performances and the use of scale. "Phil Spector" takes place mostly in large, more-or-less public spaces -- offices, hallways, conference rooms, hotel rooms, studios and, notably, the courtroom (with TV cameras), a rehearsal courtroom built on a soundstage, and a vast, open, empty office space where defense counsel is headquartered. (You can't hear the reverb from the Wall of Sound echoing within these walls, but you can almost see it.) The shooting itself takes place in what feels like Spector's inner sanctum, a kind of throne room devoted to Abraham Lincoln memorabilia ... and guns, where the shooting occurred. His Xanadu even has a massive fireplace that's photographed to remind you of Charles Foster Kane's. When Baden visits the castle for the first time, on a dark and stormy night (the place also feels like the Bates house in "Psycho"; there are all-seeing owls mounted on the walls), she creeps through a labyrinth (where does the minotaur live?) of darkened chambers and hallways as if wending her way deep into the private recesses of Spector's convoluted mind. I don't know how much the stylized verbiage known as "Mamet-speak" has evolved in recent years, since "Glengarry Glenn Ross" and "House of Games," but you can certainly hear the echoes of it, especially in the rat-a-tat rhythms of Pacino as "Phillip" and Jeffrey Tambor as attorney Bruce Cutler. If you only know Tambor from his priceless characters Hank Kingsley ("The Larry Sanders Show") and George Bluth ("Arrested Development"), you owe it to yourself to see what else he can do. Of course, everything and everybody is eerily, enjoyably exaggerated here; I mean, you don't go to Mamet for underplaying or under-writing. I've seen a few reviews in which Pacino has been criticized for turning in a standard-issue Pacino hambone performance, but that misses the point. If you've seen Vikram Jayanti's not-at-all-subtle 2009 documentary "The Agony and the Ecstasy of Phil Spector" (and you really should -- the full-length feature is embedded below), which consists primarily of interviews with Spector conducted during his first trial, you'll see that Pacino is not overdoing his character's craziness. Pacino and Spector share a middle name, and that's "Excess." But, come on: For his entire career Pacino has swung intemperately between tamped-down canned ham ("Glengarry Glenn Ross," "Carlito's Way," "Donnie Brasco") and the fully smoked variety ("Scarface," "Scent of a Woman"). His work in the "Godfather" films runs the gamut, from "That's my family Kay, not me," to "IN MY BEDROOM! Where my wife sleeps! Where my children come and play with their toys." He wears the wigs (sometimes he really does look uncannily like Adam Sandler), he sputters and rants, he trembles and explodes, but honestly, he doesn't overdo it. He gets him, and gives his interpretation of him. Remember: This is the nervous, frightened, insecure, arrogant, socially maladjusted little man who wrote "Spanish Harlem," one of the loveliest and most complex pop songs of the century, who produced the gargantuan-sounding singles "You've Lost That Lovin' Feelin' " (Righteous Brothers) and "River Deep, Mountain High" (Ike and Tina Turner) among many others, who compares himself to Da Vinci and Galileo and has been known to sport hair more ginormous than all of them put together. There's no such thing as "too big." In the end, Mamet characterizes Spector as a minotaur who kept himself holed up in his castle because he knew he was a danger to others and to himself. Clarkson was the faded beauty and Spector was the beast -- a monster who was also an artistic genius, and who knew he contained both within him. P.S. For what it's worth (and I'm not sure it's worth much), both Clarkson's friends and Spector's wife have denounced the film for portraying their loved ones unfavorably and inaccurately.